A. What genes are associated to alcohol use disorder in the databases? B. What subtypes of depressive disorders are available in the database? C. Which genes support the association between depressive disorders and alcohol use disorders? This tutorial describes the main functionalities of the PsyGeNET web interface. The PsyGeNET web interface has two entry points: the Search view and the Browser view. In both cases, the data can be explored in a “disease-centric” or a “gene-centric” way. 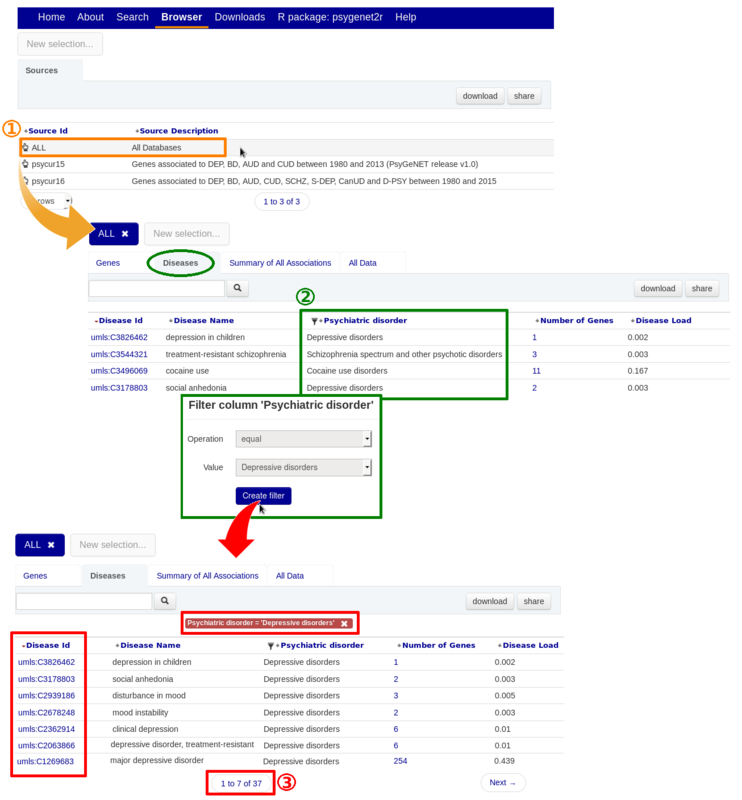 In the Search view, the user can perform queries for individual genes or diseases (using the search box), or for lists of genes or diseases (using the multiple search button, Figure 11). Select the type of search by clicking on the gene or disease radio buttons. If you are interested in a gene, type the name of the gene on the search box, for example "brain-derived neurotrophic factor". You can also perform searches using standard identifiers, such as the gene symbol for genes (e.g. 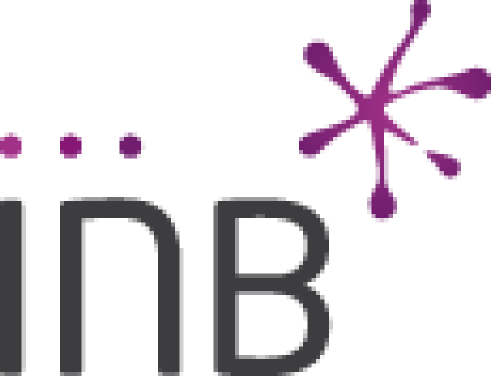 BDNF) or UMLS concept identifiers for diseases (e.g. C0001973). - General information about the disease: disease identifier in the UMLS, disease name and psychiatric disorder. - The top 10 of genes associated to this disease. Click on the “Top 10 genes associations for this disease” hyperlink to obtain a preview of the top-ten with the highest evidence index associations. Click on "Browse details" (Figure 2) to inspect all the results in more detail. This will open the “Summary of Associated Genes” tab in the Browser view (Figure 5). On the other hand, if we select diseases from the radio button, type “depressive” in the search box and click on the magnifying glass icon to submit the search. In this case there is not any disorder in the database with this exact name, so a pink box containing all the diseases names that have as disease synonym containing "depressive" term will be displayed (Figure 3). The Browser view presents the results of your search from different perspectives (the tabs), and allows to perform additional searches within these results. They may be filtered according to pre-defined parameters, downloaded, and shared. Furthermore, scripts to retrieve the results of the searches are automatically generated. Notice on top of the tabs (blue buttons) the parameters used in your query: the disease (“schizophrenia”) and the data source (default value is ALL, Go to http://www.psygenet.org/web/PsyGeNET/menu/about#sources to obtain a more thorough description of source databases). You can change these parameters by closing the corresponding buttons. The tabs available are: “Diseases” tab (or Genes tab), “Summary of associated genes” tab, and “All association evidences” tab. The “Diseases” tab shows information in the particular disease that was searched. 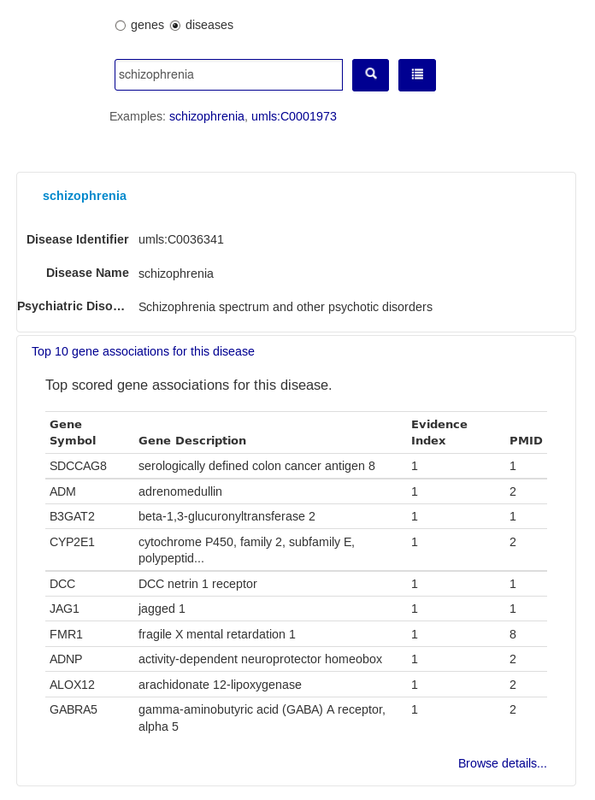 In this example for schizophrenia (Figure 4), the disease Id (UMLS CUI), disease name, psychiatric disorder, number of genes associated to this disease and the disease load are shown. The Psychiatric disorder classes indicate to which class this particular disease concept belongs to. The Psychiatric disorder classes currently covered by PsyGeNET are alcohol use disorders, bipolar disorders and related disorders, depressive disorders, schizophrenia spectrum and other psychotic disorders, cocaine use disorders, substance- induced depressive disorder, cannabis use disorders and substance induced-psychosis. By clicking on the number of genes (in this case 861), the “Summary of all associated genes” tab will be opened (Figure 5). The “Summary of all associated genes” tab presents one record per gene-disease association. By clicking on the counter at the bottom of the page, you can find out the number of genes associated to your disease. In this case, 861 genes are associated with “schizophrenia” (umls:C0036341) in the ALL subset. You can visualize more associations (up to 100) using the dropdown menu at the bottom-left of the page, and navigate to the next set of associations through the “Next” button at the right hand corner. The search box allows performing free text searches within the results of each tab. For instance, you may search for a particular protein class within the genes associated to schizophrenia. To do so, type the name of a protein class, for example “receptor”, and only the schizophrenia genes corresponding to this protein class will be displayed (Figure 6). The gene-disease associations can be ranked according to the number of supporting publications (Figure 7) or the evidence index (Figure 5). By default, the associations are ranked by the evidence index. In addition, you can also visualize only a subset of the results by applying a filter based on the evidence index. Click on the filter icon and choose a cut-off value, for example greater than or equal to 1. This will indicate that all the publications that report associations have been validates as "association" in the curation process (Figure 8). For more information on the evidence index click here. 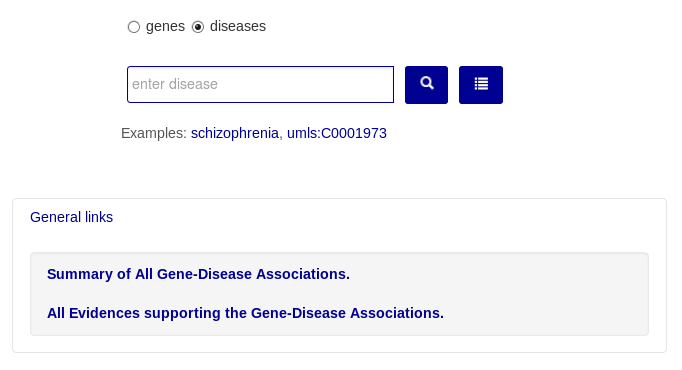 If you want to see more in detail the evidences supporting the association between two entities, for instance schizophrenia and the ERBB4 gene, you can write the gene name in the box or click on the number of publications validated (Figure 9). In the “All association evidences” tab (Figure 9), there is one line per evidence supporting the association between the gene and the disease. The number of evidences depends on the original source(s) reporting the association and the number of publications supporting each disease association. For each publication, we show an exemplary sentence where the gene and the disease are highlighted. The gene and disease are highlighted in different colors in the sentences (orange for genes and green for diseases) to easy visualization. Note that in the Browser view you can change any of the parameters of your original query by closing the buttons that appear at the top of the page. 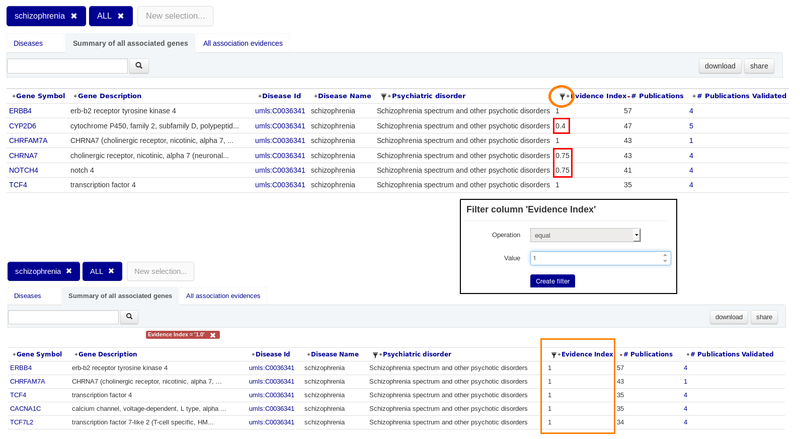 Closing the “ERBB4” button (Figure 10) will lead to the “All association evidences” tab that shows the evidences linking schizophrenia to its associated genes for PsyGeNET ALL (1489 evidences). Alternatively, by closing the button representing the source database (e.g. ALL), the list of available sources will be displayed (Figure 11). This view allows browsing the information contained in PsyGeNET selecting a particular source database, for example psycur16. In the Search tab we also have the possibility to look for multiple genes or diseases at the same time. In order to do this we have to use the “Select multiple diseases (or genes)” button in the Search tab and create a filter. For example, let’s search for the genes associated to alcohol dependence (umls:C0001973) and schizophrenia (umls:C0036341). In “Select column” choose 'UMLS concept unique identifier'. 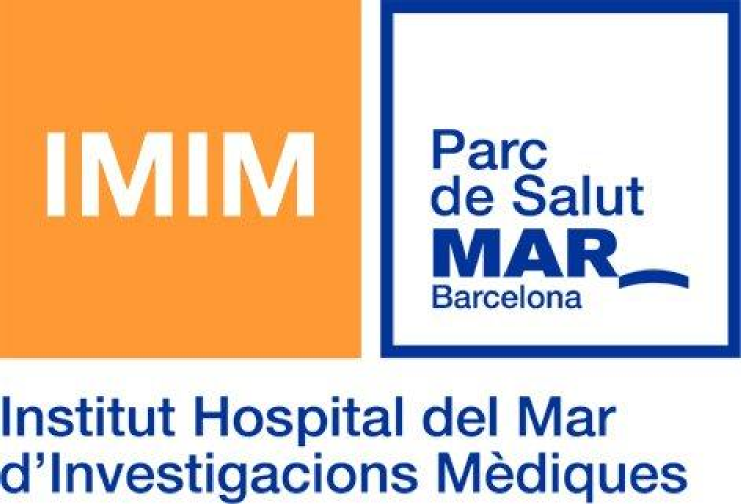 In this way we will use one of the pre-compiled lists of diseases, in particular the one that contains the UMLS CUIs umls:C0036341 and umls:C0001973. In filter name put a name of your choice, and in Values type the UMLS CUIs codes, separated by comma or one per line. We then click on Create Filter and the summary results for all the UMLS CUIs included in this disease class (in this case there are three CUIs) will be shown (Figure 12). 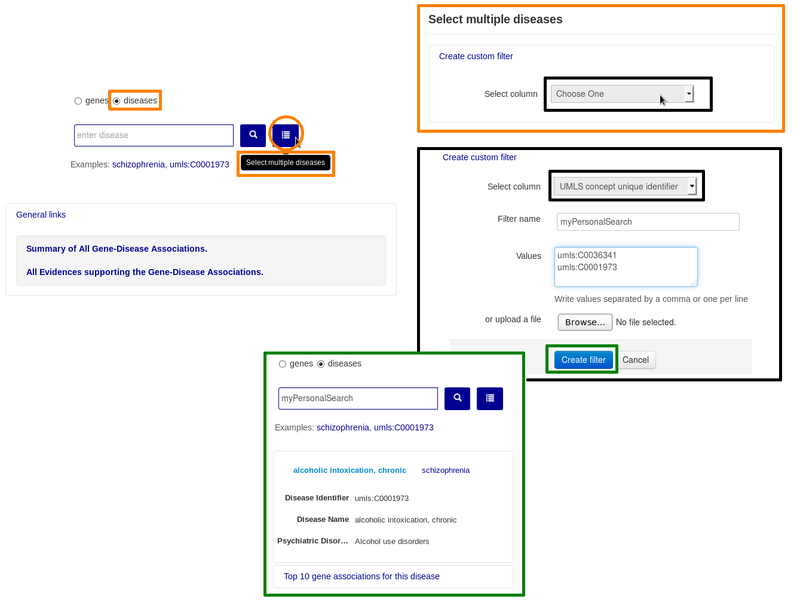 Alternatively, the “Select multiple diseases (or genes)” functionality can be used to upload a list of diseases (or genes) defined by the user and retrieve the PsyGeNET annotations for these diseases (or genes). Downloading the results Finally, using the “download” button you can download the results of this query as a tab separated file. More interestingly, each step of your query and filters is recorded in the system and can be executed again by R, Perl, Python or bash scripts that are generated automatically (Figure 13). These scripts are also available from the download button, and can be incorporated to your own data analysis workflow. Alternatively, you can share your results by sending a link by e-mail or embedding an HTML view of the results on a web site (available from the “share” button). Note that once you download the script, you can modify it to perform different queries. This script can be executed at any time to reproduce the results obtained using the web platform, and can be integrated into complex bioinformatic workflows to annotate genes and diseases with PsyGeNET data. Figure 13 shows a simple python script generated from a query. A. What genes are associated to alcohol use disorder in all databases? To answer this question we can query the database for all the genes annotated in expert-curated sources for the Alcohol Use Disorder concepts defined by PsyGeNET experts. In order to do this we have to use the filter option. First, we go to the Browser tab and select the database of interest, in this example "ALL" (Figure 14, 1). 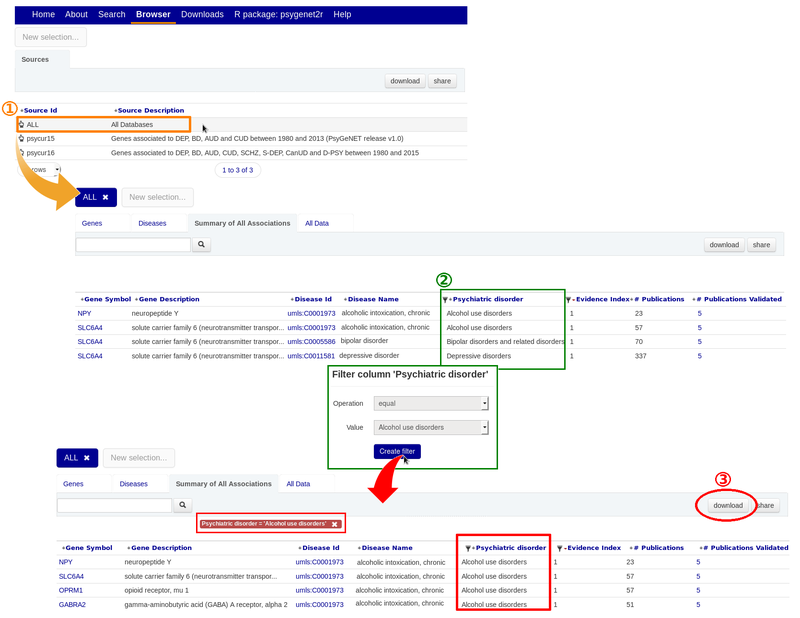 By clicking on the database, the “Summary of All Associations” tab will be opened. The next step to obtain the genes that are associated to alcohol use disorder, is applying the filter based on the psychiatric disorder (Figure 14, 2) and selecting our disorder of interest. We then click on Create Filter and the summary results for all associations included in this disease class will be shown (Figure 14, 3). You can download the results, and extract the genes, that are shown in the first and second column (gene symbol and gene description respectively. Depressive disorders is a heterogeneous disorder involving different disease manifestations. To answer this question you can use the filter option, as before. So, first we go to the Browser tab and select the database of interest, in this example "ALL" (Figure 15, 1). By clicking on the database, the “Summary of All Associations” tab will be opened. We change it to the "Diseases" tab. The next step to obtain the subtypes of depressive disorders is applying the filter based on the psychiatric disorder (Figure 15, 2) and selecting our disorder of interest, in this case "depressive disorders". We then click on Create Filter and the summary results for all the UMLS CUIs included in this disease class will be shown (Figure 15, 3). This, results in 37 depression disorders concepts, each annotated to different numbers of genes (from 1 to 276 for each concept)(Figure 15). The genes annotated to each depressive disorder subtype can be visualized, and the supporting evidence explored. The results of the search can be downloaded and further processed with bioinformatics tools to perform functional enrichment analysis in order to learn more on the function of these genes. This question can be answered by downloading the genes associated to each disease from PsyGeNET, and looking into the ones that are shared by both diseases. To do so, you can follow the steps explained in point 1 for both depressive disorders and alcohol use disorders, selecting the database source of your choice. 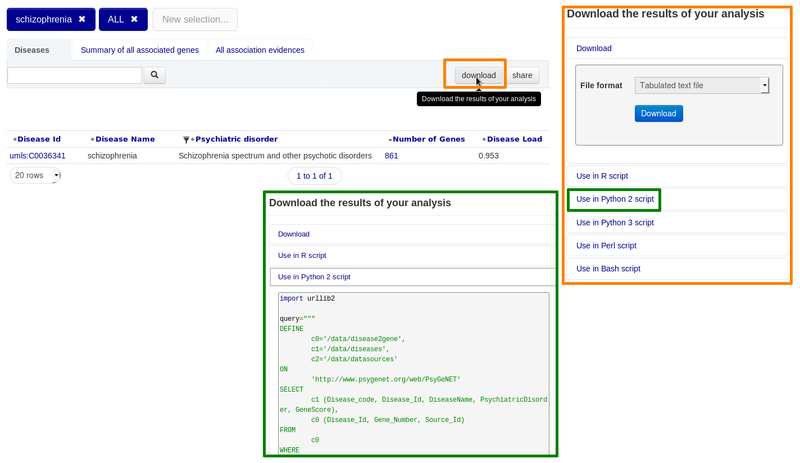 Once you obtain the results of the search, by clicking in the download button you can get a file with the genes associated to each disorder. 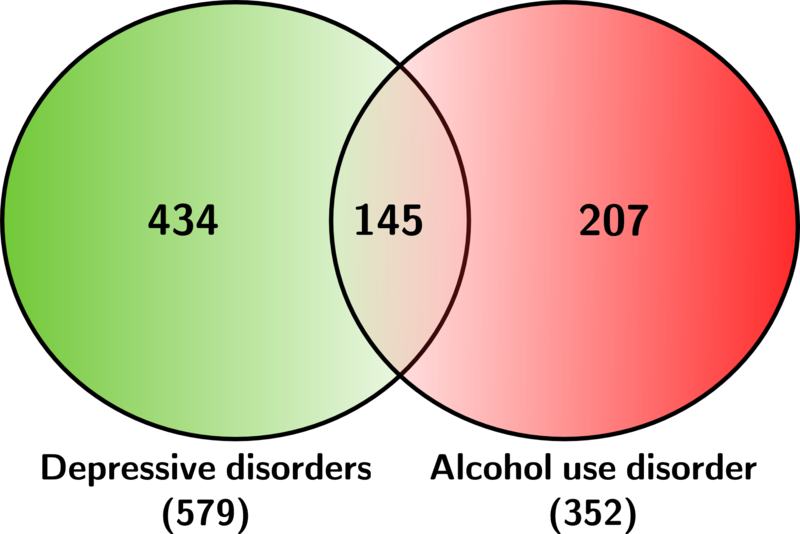 Figure 16 shows that 145 genes (25.04 and 41.19 % of depressive disorders and alcohol use disorders genes, respectively) are in common, suggesting that common biological networks might be underpinning both diseases and providing hypothesis to explain this comorbidity. This document describes the guidelines for the curation tasks required for the new release of the PsyGeNET platform. The curation tasks was assisted by the PsyGeNET annotation tool, thus this tutorial also describes how to use this tool. The file contains the curation guidelines in PDF format.